Guitar Making Tip No. 28 is about your fretboard. The fretboard is a small piece of wood, and easy to replace if you make a mistake. So many people sweat bullets while slotting their fretboard. Thankfully, there is an easier way. In the beginning, if you are buying normal pieces of wood, your fretboard should be fairly inexpensive. This means, if you make a mistake sawing the frets, you can be back in business for a small mount of money. For this reason, do not stress out as you are sawing the fret locations. Yes, they need to be precise, and yes the guitar will sound off if they are not. However, you control what gets on your guitar, so if you make a mistake, just get a new board and try again. This will help you build with less stress, and you will actually build better. when you work on your guitar, you need to try as much as possible to relax. 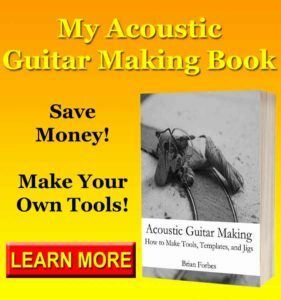 It can be hard, especially when you are concerned about making a great guitar. However, the more you stress about it, the harder it will be. Stress causes you to use a part of your brain and body energy for something other than concentration on your project. This energy drain reduces you ability to think, and leads to you making more mistakes than normal. A way to alleviate this problem is to just relax. There are no huge consequences for making your guitar or not, and you can do it if you just have patience. If you need some help, tips are a great way to build knowledge and confidence. If you make My Guitar Fretboard Slotting Jig, you can literally slot an entire fretboard without measuring once. 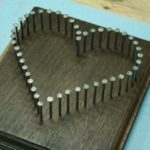 This takes all of the stress out of the process, because you know that the slots will be in the right places every time. 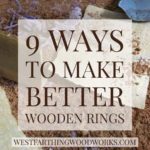 The beauty of this jig is that you can make it from scraps in the shop. This means that not only is it an awesome jig, it’s also a free jig. This also means you can start slotting your fretboards with more confidence right away. 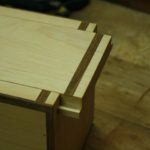 Jigs are awesome, and you should get as many off them into use in your shop as possible, especially if you are a stressful guitar maker. Jigs mean accuracy and uniformity, so the more you make, the less stressful your building processes will be. Your homework is to build my fretboard slotting jig. Not only can you build it for free, but you can make your process a lot easier by using it. You can also batch your fretboards with the jig, because it works so fast. I routinely slot several fretboards at once. It can actually take longer to haul out the jig than to slot the board. 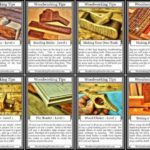 If you are going to go through that effort, use slot several boards. Then, the next time you need one, you just need to grab it from the pile. Either way you go, you need to reduce your stress level if you are a worried guitar maker. This is all on you though, and you need to figure out why you are worried. Eliminate stress causing things like timelines, and messes in the shop, and that will be a good start. 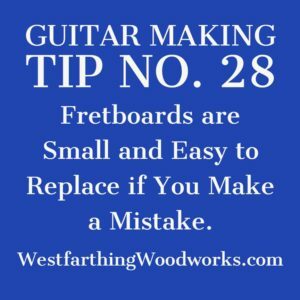 Guitar Making Tip Number 28 is about the fretboard, and how it is such a small piece of wood that is easily replaced if you make a mistake. Don’t stress over the fret slotting process, and just relax. This means better slots, and an easier time. 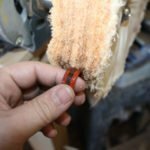 If you cannot do the hand slotting process very well, or you are getting tired of making mistakes, consider building a jig. My fret slotting jig is a great start, and you can make it from scraps, which means it’s free. Reduce you stress level in the shop, and think about what you are making. A $20 fretboard is nothing to be super worried about. If you make a mistake, just toss it and make another. It’s just a little more practice, and you will still have a great guitar in the end. 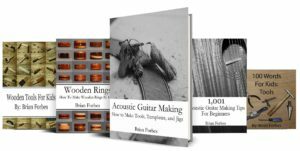 If you have any questions about Guitar Making Tip No. 28, please leave a comment and I will be glad to answer them. Also, please Subscribe so that you don’t miss out on anything new. Happy building.